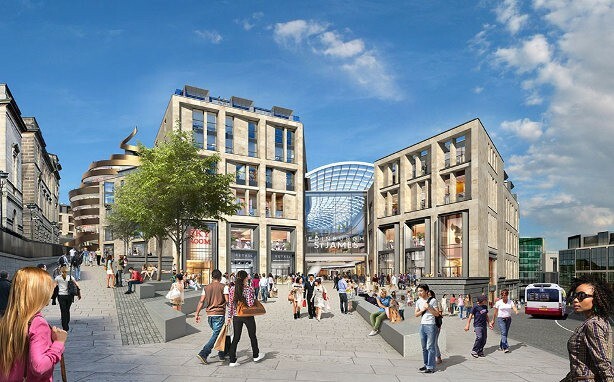 The Edinburgh St James project has an estimated investment value of over £1billion, and is a commercial development in the heart of Scotland’s capital, closely located to Edinburgh Castle and Princes Street, the city’s central shopping precinct. Laing O’Rourke is the principal contractor delivering the 1.7million ft2 development which replaces the existing St James Centre constructed in the 1970s, and became the main contractor in October 2016, following a period of enabling works. Laing O’Rourke has been working with TH Real Estate since spring 2014 providing early advice on construction solutions and costs to develop a project that is deliverable within the required timeframe and budget. A world-class example of city enhancing place-making, Edinburgh St James will be one of the UK’s largest and most significant regeneration projects. Construction started in 2016, with completion due in 2020. Digital Engineering has been used extensively to develop solutions for the complex underpinning works, demolition and logistics management for this busy city-centre location. Due to the vast number of fittings required to illuminate a project of this scale, the lighting system WysePower have designed is an LED option with integrated PIR sensors. This ensures that unoccupied areas of site will see the lighting automatically dim to 10% of standard output and reduce unnecessary energy use and as the workforce travel throughout site, lighting will automatically illuminate. Unlike traditional energy management systems, the new PIR system allows each light to work independently to ensure optimum lighting energy use 24-7 and meet with the high sustainability standards of Laing O’Rourke. Local employment and upskilling through apprentice intake.